In this article we will strongly type the FormView control using Visual Studio 2012(.Net Framework 4.5). Using Strong typing helps in checking for errors while binding data when you write the code and makes it easy for development. 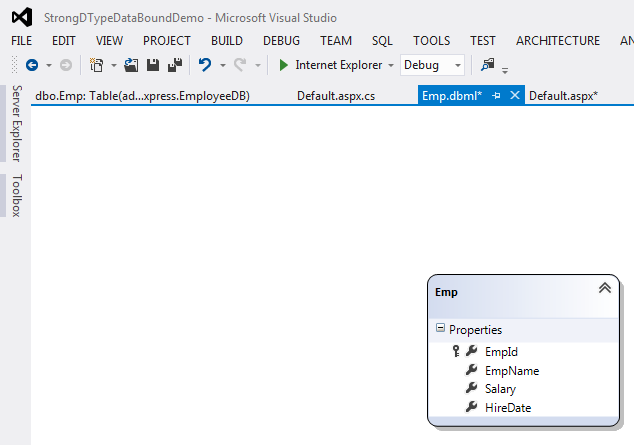 1.Here FormView is a Strongly-Typed data control because we are using the ItemType property in the FormView. we are setting it to "StrongDTypeDataBoundDemo.Emp" this means that the controls present in the FormView control will be data bound to the properties of the Emp class(i.e., Columns of the Emp table). 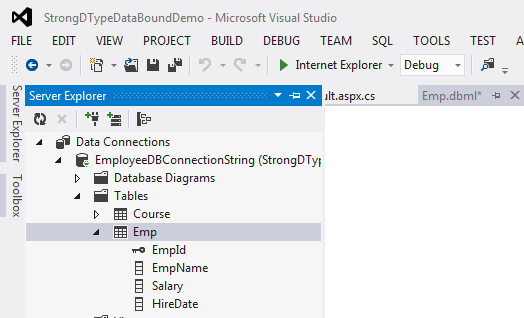 In the above FormView control we are binding Emp details (EmpId,EmpName,Salary,HireDate) from the Emp class, Here we are setting ItemType="StrongDTypeDataBoundDemo.Emp" Emp is the LinqToSql entity class which holds the Emp table information. 2.Then we are using BindItem to display the database table column values using the BindItem.ColumnName naming convention. We can use either BindItem or Item to access the properties of the Emp class. 3. We want to format the HireDate column to display only the date part without the time for this reason we are using Item.HireDate.ToShortDateString() to display only the date. 4.If we type an invalid column name in the FormView child controls to bind the invalid column. It gives an error as shown below and we can correct it to EmpName column.